The move marks the biggest deal in the history of Russia-China partnership in venture capital investments. Russia-China Investment Fund for Regional Development (RDIF) will allocate RUR 1.5 bln ($22.8 mio) for the tree funds managed by Skolkovo Ventures, and will act as the anchor investor in two new Skolkovo Ventures funds with a total of RUR 300 mio ($4.6 mio). The agreement has been signed during the Open Innovations forum, which is currently underway in the Skolkovo innovations center. The strategic partnership agreement aims to provide new business opportunities for both Russian and Chinese high technology companies. The deal implies the sides’ joint participation in current venture projects implemented by the organizations and managed funds, as well as joint launch of new funds, Sk.ru reported citing a statement from Skolkovo Ventures. The strategic partnership will be implemented in two stages. During the first stage, the sides will exchange minority stakes in the capital of the managing companies, whose boards will include representatives of each side. 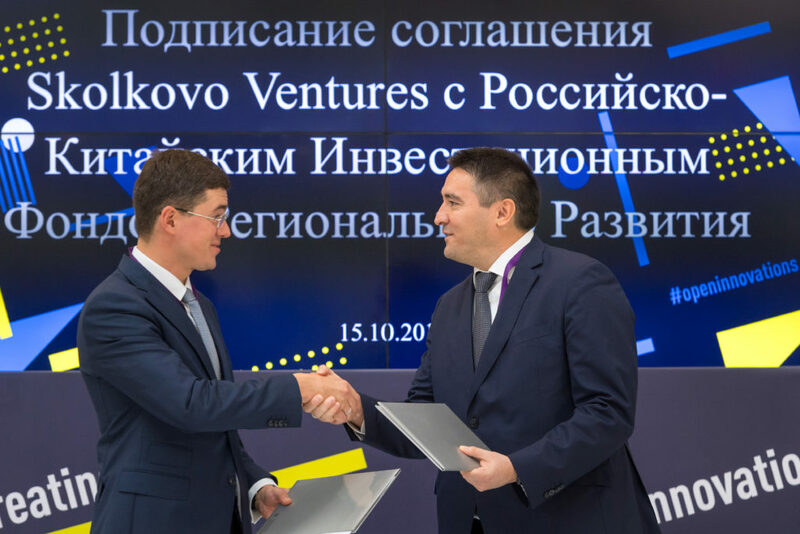 RDIF will make investments in the three existing Skolkovo Ventures funds: Skolkovo Digital, Skolkovo – Industrial 1, and Skolkovo – Agrotechnical 1. The sides plan to add the new partner to the funds in 2018, while exchange of stock will take place by the end of the first quarter next year. The second stage implies the launch of two new investment funds to be jointly established by the end of 2019: the Special Situations Fund and the Fund of Hi-Tech Vertically Integrated Companies. “Attracting international investors and providing Russian venture companies’ access is a planned stage of development of Skolkovo Ventures and the Skolkovo innovations center’s ecosystem. We are confident that the current stage of cooperation with our Chinese partners is only the first step in the two countries’ partnership in the venture investment market,” Skolkovo Ventures Director General Vasily Belov told Sk.ru.